Jobst Opaque Knee High Compression Socks Closed Toe 20-30 mmHg are compression stockings with a mild to moderate compression rating, designed for women. 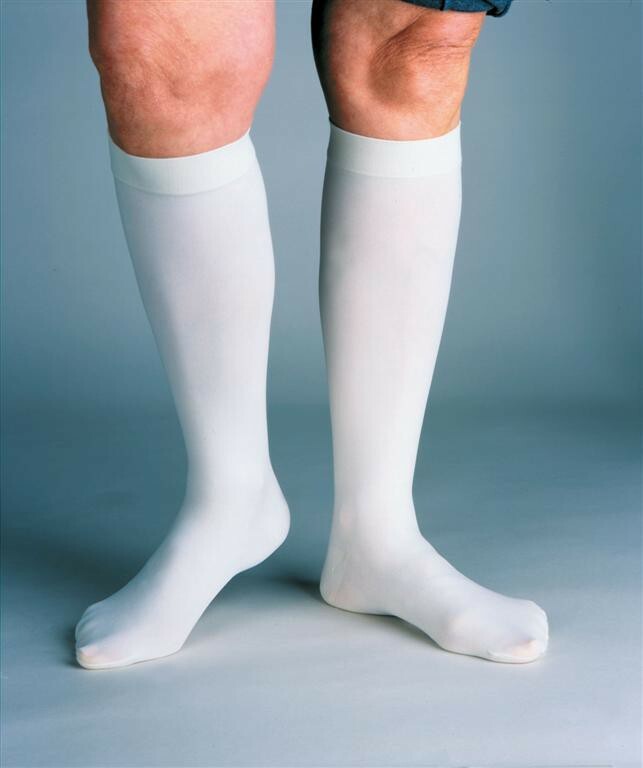 These Knee high compression stockings by Jobst are designed apply pressure to the legs that would alleviate muscle aches, swelling, and chronic venous insufficiency, among other things. Jobst for Women Compression Socks are opaque so that they will mask varicose veins and skin imperfections. Available in four colors, these Jobst Compression Stockings for Women are ideal for any outfit. The durable yarn is soft to the touch, but will last for several washings. Jobst womens product numbers: 115128 , 115129 , 115130 , 115131 , 115132 , 115133 , 115134 , 115135 , 115136 , 115137 , 115138 , 115139 , 115270 , 115271 , 115272 , 115273 , 115364 , 115365 , 115378 , 115379, 115456, 115457, 115458, 115459, 115460, 115461, 115462, 115463, 115608, 115609, 115610, 115611, 115614, 115615, 115616, 115617. I like these hose quite a bit. They are soft but quite strong. I do find the tops a bit binding, so I just let out the hem and they are fine. Appreciate the better price than I've been getting from another vendor, and the fast shipping!